NEWS : JENTON GROUP and TPI Inc.partner to meet food industry temperature sensing requirements. Jenton International has been active in the food industry since the 1970s and is well known for its Banding Machines, ARIANA Food Automation Equipment and patented JENACT UV Disinfection Equipment. Behind the scenes though, Jenton also invested in and built up a sensing and instrumentation business concentrating on predictive maintenance, vibration analysis and sensors. In 2013 Jenton sold this business to Test Products International Inc. in Oregon USA. (TPI). TPI manufacture a huge range of instrumentation for all sorts of purposes and offer the best value in handheld test and measurement equipment. They are a huge name in the USA but not so big in the UK and Jenton is now proud to be able to help with that. 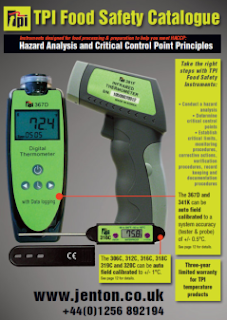 We have launched a catalogue to promote the TPI range of instrumentation and temperature measurement for the food industry. Please download the TEMPERATURE MEASUREMENT FOR THE FOOD INDUSTRY TEMPERATURE MEASUREMENT FOR THE FOOD INDUSTRY catalogue. Or visit the Ariana or JenAct websites or call us to request it and discuss the products. Of course you measure temperature already, but please look through, print and keep the catalogue, compare prices, give us your feedback and questions and hopefully, when the time is right you will want to order some of these items from us! It is certainly exhibition season at the moment. This week we are at the Print Show for the first time, and it has been a successful show so far. You still have time to visit us at the NEC in Birmingham, so pop over and say 'Howdy' to Richard, Andrew and our Jenton Bandit Banding Machine on stand P54. We also have a small range of UV Curing equipment available to look at.